In 2014,The United Nations World Food Programme (WFP), the world’s largest humanitarian organization fighting hunger, appointed me as a Celebrity Partner. Needless to say I am beyond honoured, This association is very close to my heart as I have always believed strongly in giving back to society and sharing with others my blessings. I have been closely associated with WFP’s efforts towards creating a world with zero hunger, by spreading the message to my thousands of viewers and well wishers across the world. 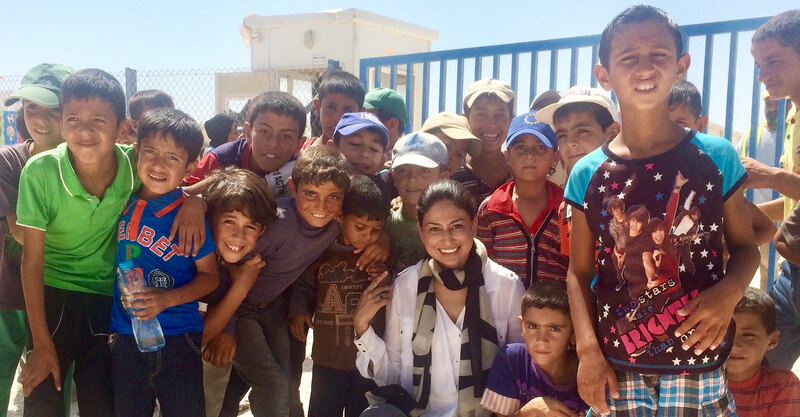 As part of her global responsibility with WFP, In 2015 I visited the Zaatari refugee camp in Jordan for a hand-on understanding of the situation. WFP is fighting hunger and providing food assistance to more than 90 million people in over 80 countries on average each year. I feel blessed to partner with WFP and make a difference in my small way. Here are some facts, and how you can help. This is an increase from the year before when 815 million people faced hunger. A total of 200 million children continue to suffer from stunting and wasting. Nearly half of all deaths in children under the age of five are attributable to undernutrition. This translates into the unnecessary loss of about 3 million young lives a year. In 2017, WFP reached more than 91 million people in 83 countries with food assistance. ShareTheMeal is an initiative of the United Nations World Food Programme (WFP). WFP is the world’s largest humanitarian agency fighting hunger. WFP is 100% voluntarily funded, so every donation counts. WFP’s administrative costs are among the lowest in the non-profit sector – with 90% of donations going directly to WFP operations that are building a world with zero hunger. Helping children in need has never been easier than now with WFP’s ShareTheMeal app, allowing smartphone users to provide children with vital nutrition with a simple tap on their phones. Worldwide there are 20 times as many smartphone users as there are hungry children. ShareTheMeal makes donating more social and more engaging. Users can follow the progress of WFP’s fundraising efforts through the app and see where WFP has already helped. Click below and know more and if possibile feed a child.